I got a new look! I've been wanting to do a more nautical/beachy/coastal look for a while; I've just been putting it off. But last night I finally sat down and made some changes. I hope you guys like it. 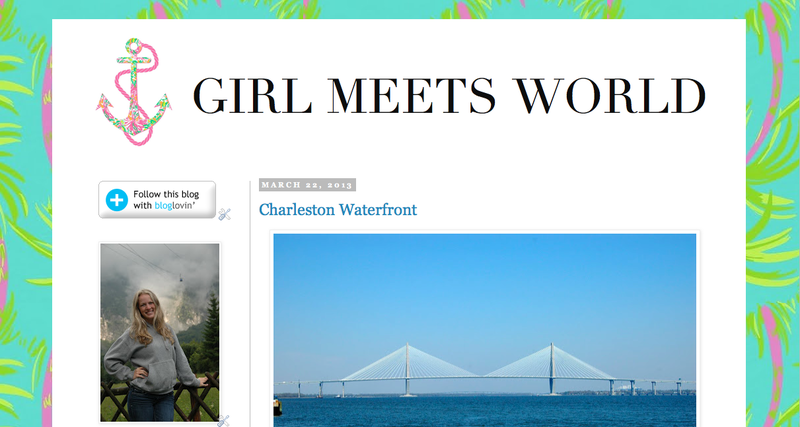 I have a little bit left that I want to adjust, but for now I'm much happier with the appearance of the blog. The anchor: I just found it online. I'm not sure who the credit goes to, just know I didn't make it. The name: I know my older readers know this, but I just want to reiterate that I did not take my blog name from the coming Disney show Girl Meets World. Yes, the name is influenced by Boy Meets World, but I came up with the name long before there was any mention of the new show. On Saturday my mom and I went to Amelia Island for the day, and while we were there we had lunch at this awesome bar & grill called Sliders. Not only was the food awesome, but it was also right on the beach, and since I love the beach it was the perfect setting. Not to mention the weather was beautiful, and I met a fellow Gamma Phi from FSU. Pretty solid lunch if I do say so myself. For lunch, I had the crab cake sliders with french fries and coleslaw with a Malibu bay breeze to drink. Unfortunately I didn't get a picture of the drink before I started drinking it, but trust me when I say it was a very pretty bev. So moral of the story, if you ever go to Fernandina Beach on Amelia Island you have to stop by Sliders. Everything is delicious, and you'll feel super luxurious as you enjoy a meal while looking out over the Atlantic Ocean. Picture perfect.